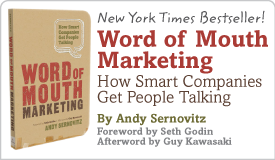 Word of Mouth Marketing in North Korea | Andy Sernovitz | Damn, I Wish I'd Thought of That! ← Why do companies still put this dumb thing in their emails? How do enough people spread the word that they are ready to stand up for change? How do leaders spread the word about specific actions? That’s why social media has had such an impact in the Middle East. In North Korea, we could bring out the military and diplomats and get tough. Or, we could drop 200 million meals from airplanes, pallets full of vitamins, child-care products, laptops, DVDs, and thousands of satellite-connected smartphones so the North Koreans can contact the outside world. All wrapped in red-white-and-blue-“Made in USA” packaging. Invasion by Walmart, Home Depot, Disney, and Google. That’s a hell of a lot cheaper and safer than what we’ve done in other countries. Share our values and lifestyle, be helpful, and win hearts and minds.